What is IQ Option Magazine? IQ Option Magazine is an unofficial website about IQ Option, which is an options, cryptocurrency, commodity, and stock CFD broker. We are a group of active traders trading with IQ Option who appreciate the good qualities and features of IQ Option and esteem IQ Option to be a top-class and good all-round broker. The objective of IQ Option Magazine is to provide accurate and useful information from active traders (trading with IQ Option) to other traders who are already trading with IQ Option or who may be interested in trading with IQ Option soon. IQ Option is a remarkable broker with plenty of tradable assets and different asset classes to choose from. Whether you fancy forex CFDs, stock CFDs, cryptocurrency CFDs, commodity CFDs, binary options, or digital options, IQ Option has all of these available on one single trading platform! ACCESS STOCKS, FOREX, CRYPTOCURRENCIES, COMMODITIES, BINARY OPTIONS, AND DIGITAL OPTIONS ON ONE SINGLE TRADING PLATFORM! IQ Option started with binary options in 2008 and has since become a notable force in the options industry who caters for both small and large market participants. With minimum deposits as little as $10, and trade sizes starting from $1, an IQ Option live account is not difficult to access at all! When it comes to minimum deal sizes and deposits, IQ Option is really competitive indeed. IQ Option boasts an incredibly robust trading platform on which 1,800,000 trades were executed daily (on average) in 2017. In 2017, IQ Option had 25,580,000 registered users and processed withdrawals of $10,800,000 per month (on average). IQ OPTION CAN EFFORTLESSLY HANDLE MILLIONS OF TRADES PER DAY! With more than 78 representatives on their support team, IQ Option is geared towards matchless customer service and also processes withdrawals within one business day (on average). IQ Option Europe Ltd. is registered at Cyprus, and is regulated by CySEC. IQ Option Ltd. is registered at St. Vincent and the Grenadines and this entity is not regulated. CySec is the Cyprus Securities and Exchange Commission. CySec is committed to protecting investors from unfair or fraudulent behaviour from brokers and are available to investigate complaints which have to do with such actions. CySec also considers the various risks faced by investors and takes certain measures to mitigate these risks (for example, by limiting the leverage available on specific trading instruments which may be very volatile or illiquid). Brokers who are regulated by CySec need to adhere to certain rules and guidelines which are designed to protect these brokers’ clients from unnecessary risks. Clients who trade with CySec regulated brokers can rest assured that these brokers are forced to adhere to fair and responsible dealings with their clients and are consistently monitored by CySec. IQ Option is a great all-rounder in many ways, and also when it comes to the trading instruments it offers. 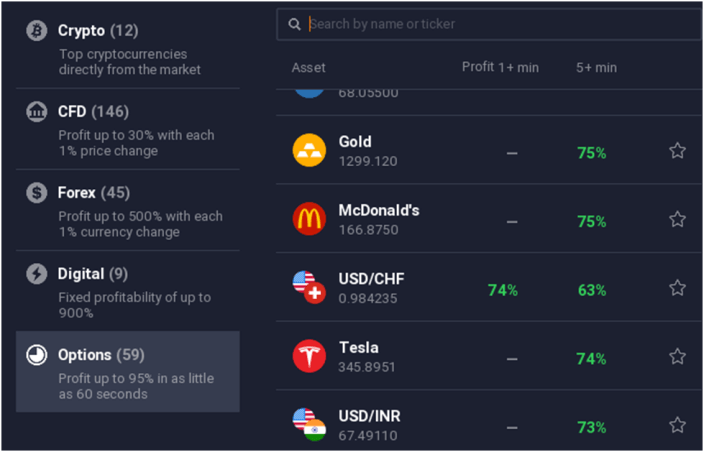 IQ Option covers the forex, cryptocurrency, stock, and commodity markets and offers CFD trading on cryptos, forex, commodities, and stocks. Of course, IQ Option offers binary options on forex pairs, certain stocks, and certain commodities. It also offers digital options on certain currency pairs. OTC binary and digital options are available over weekends for those traders who like to trade over weekends. Traders who engage in options trading with IQ Option will find that payout percentages change from time to time. On binary options, the maximum payout percentage is *95% and on digital options it is *900%. *Amount to be credited to the account for a successful trade. **Binary and digital options and all OTC binary and digital options offered by IQ Option are only available to non-European Union clients. Cryptocurrency fans who require more than just crypto CFD trading, can utilize IQ Option’s cryptocurrency exchange on which ‘market’ and ‘limit’ orders can be used on a state of the art trading platform with advanced charts and numerous indicators. IQ OPTION PROVIDES PRETTY CONVENIENT ACCESS TO THE CRYPTOCURRENCY MARKET. IQ Option clients can also access the Hodly cryptocurrency wallet directly with their IQ Option login details. With Hodly, clients can instantly buy cryptocurrencies with their credit or debit cards and have 15 cryptos to choose from. (This number may increase at any time, of course). With IQ Option’s crypto exchange and with Hodly, clients are able to ‘physically’ own different cryptocurrencies, whereas with crypto CFD trading, the underlying cryptocurrencies are not actually owned. *Special note: IQ Option’s crypto exchange isn’t available at the moment. It will be revised and is in beta at the moment. 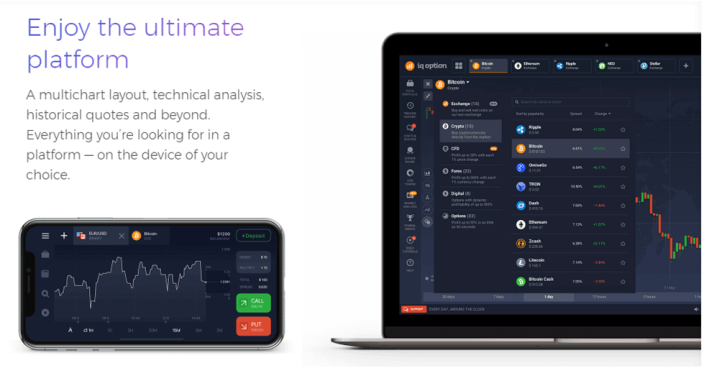 In the meantime, clients are invited to use the Hodly crypto wallet which offers numerous benefits and eminent features. IQ Option clients can access the markets from their personal computers and from mobile devices. Trading platform downloads are available for different operating systems and traders can also access IQ Option’s online trading platform from their browsers. WHEREVER YOU ARE, IQ OPTION’S TRADING PLATFORM IS ACCESSIBLE TO YOU! IQ Option’s demo account is really great because it has all the features of a real money account (live account). Traders can easily switch between their live and demo accounts and traders without live accounts can also use a demo account to practice their trading on. Another cool feature of the demo account is that traders can top up its balance to the original value at any time. IQ Option has many awards under its belt and is truly a great innovator in especially the binary options trading industry. IQ Option is often praised for its excellent trading platforms and apps and for just being an incredible broker. 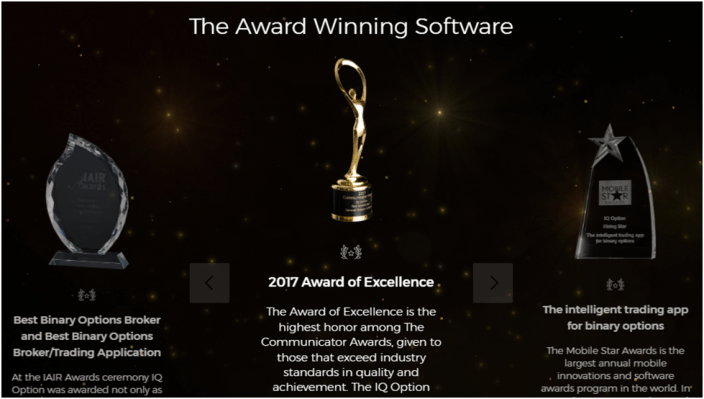 Considering IQ Option’s easy-to-use interface, excellent customer support, variety of instruments supported, and many other great features, more awards will certainly be added to this broker’s impressive list of awards. IQ OPTION HAS TRULY DESERVED ITS REPUTATION AS AN AWARD-WINNING BROKER! We are excited to share our experience about trading with IQ Option and we’re looking forward to providing useful information about this superb broker’s platform and features. Good luck with your trading and enjoy what IQ Option Magazine has for you!